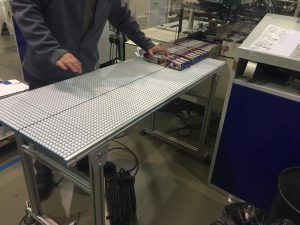 Just thought I would let you know that every time I see the customer, he tells me what a brilliant conveyor the KBS is – expensive, but well worth the money, as it allows the packs to collate perfectly sitting on the horizontal, for the operator to lift in multiples for case packing. members involved in the project. The entire process from concept to FAT and installation was effortless, enjoyable and professional. Both conveyors have exceeded our original expectations in terms of design and throughput. Well done again to all involved and thank you for providing a genuine turnkey solution. You provided an exceptional service encompassing in depth knowledge of the capabilities of products you provide, excellent knowledge of the product availability & lead times with the flexibility to deliver the parts in time to save our company from multiple shifts of potential downtime.